This must-see French suspense thriller focuses on an imprisoned female serial killer, recruited to help solve a string of copycat murders, but only if her son, Damien, now a policeman, works with her on the case. The mother is nicknamed “La Mante”, the praying mantis. First, it may be helpful to understand the biological nature of the praying mantis: the female camouflages herself and often ambushes the males and eats them live. The levels of tension just increase from the beginning till the end as the viewer watches the stalking and the violent killing. All victims in La Mante are men. Is the serial killer a woman? Mom–Jeanne Deber (the beautiful Carole Bouquet)–is serving a life term without parole for the brutal murders of eight men. We do not know the motivation for her heinous killings. She has been serving a prison sentence for twenty-five years as La Mante opens, and we flash back to her abandonment of her young ten-year-old son as the police drag her her sobbing little boy away. The viewer will understand the motivation and unhealed wounds Jeanne suffered by the final episode’s thrilling climax. 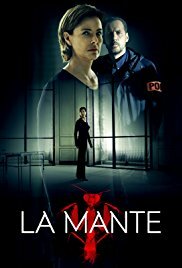 Damien, now a senior investigator in Paris, is ordered to investigate a series of killings nicknamed the “Copycat Mantis”. He is deeply wounded by the purported death of his mother (whom, at first, he does not know was the notorious “Mantis”). Desperate to help catch the killer and prevent future murders, Damien reluctantly agrees to be involved in the police investigation at great cost to his personal life and his relationship with his young and incredibly understanding wife. The twists and turns in each of its six episodes never fail to be compelling. With echoes of “The Silence of the Lambs” and “Hannibal” this dark and very bloody thriller never holds back with even the most gruesome shots of corpses. La Mante is certainly not for the weak of heart; if your stomach isn’t the strongest, I’d recommend passing – or watching the more bloody sequences with one hand over your eyes. The suspense and performances at their core, however, make La Mante well worth every hard-to-watch scene. The clever red herrings and false starts at identifying the copycat mantis are tightly woven into the subplot of the mother-son relationship and the son’s own misgivings about ever becoming a parent. Very dark, troublesome, and pathological areas of human relationships are explored–sometimes venomous, toxic and unforgivable. La Mante is another success in French cinema–especially well-focused on the mother-son relationship, or the possible murder of a relationship from lying to those we leave behind. As in real life, the criminal mind is traced back to events and backstory in childhood. La Mante is an astonishing opening of ruptured wounds traced back over a quarter of a century ago. Astonishing, provocative and gasp-worthy. Warning: not for all tastes! Note: Available to stream on Netflix. Sounds great, however, it may not be a pre-sleep thriller! Anne with an E has been my speed lately Thanjs, it really does sound very well acted! La Mante is intelligent, diabolically clever and one of the best thrillers ever. Even my husband, who likes very little he’s seen on Netflix, Amazon et al…was enthralled. I can tell from your review that I wouldn’t be interested. Too much gore. I don’t find that entertaining. I’m sure there’s an audience for it, though.